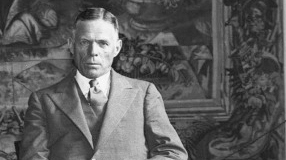 In 1933 the University's unassuming history department chair became the US envoy in Berlin. Data from the South Pole Telescope support the most widely accepted explanation of dark energy and home in on the masses of neutrinos. UChicago's Resident Masters program puts senior faculty members at the forefront of students' dorm life. Faculty, staff, and students appreciate the library's new Scan and Deliver service--and not just because of the name. Court Theatre's calm and meticulous artistic director has shaped some of the "most celebrated, popular Chicago productions in recent memory." Rookie alderman and third-year SSA student Ameya Pawar, SM'09, reflects on his first year in office, including how Chicago faculty treat him now (they're not impressed). Eight tips from Vonnegut, AM'71, to keep the pages turning--or to help readers finish the story themselves if cockroaches eat the ending. Material from Earth is predominant on the moon, UChicago researchers report, challenging the prevailing theory of how it formed. Chicago Booth finance professor John F. Cochrane argues for deregulated health care and health-insurance markets. "First, remove the brain ..."
Practice the art of mummification with Anubis, the god of embalming. 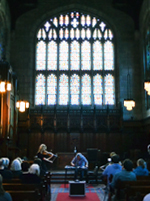 The Renaissance Society brings experimental music to Bond Chapel.